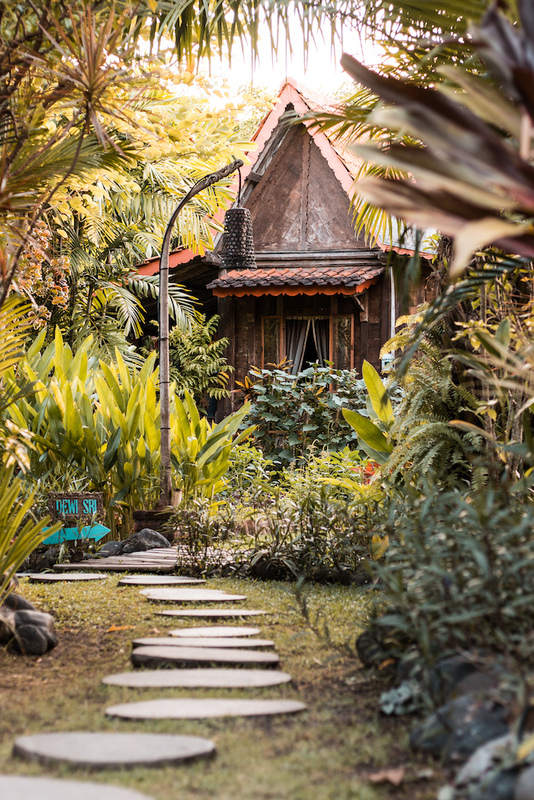 The Abridged: Tropical Hobbiton retreat by way of Bali (because saving Middle-earth can be tiring). Sixteen individual cottages, rescued and reclaimed from around Indonesia, are dotted amidst an undergrowth of exotic plant-life. Guilt-free organic and locally sourced food, an impressive yoga schedule, and arguably the best Balinese massage on the island. Lifelong nomad, Thomas Talucci, moved to Bali from the US over twenty years ago. "There was nothing but rice paddies as far as the eye could see", he says about Canggu, the the town surrounding Desa Seni. With a few more hotels, and a lot more matcha lattes than before, it's still a far cry from the trendy 'scenes' of Seminyak and Kuta. A furniture designer by trade, he has an undoubtable eye for design. Styled like a traditional Indonesian village, there is something utterly fairy-tale about Desa Seni. Championing wellness and eco-chic at every turn, it's a big no to plastic, and a huge yes to organic vegetables. Sixteen authentic Indonesian houses, some over a century old, were reclaimed from around the archipelago, and reappropriated in the magical grounds of Desi Seni. 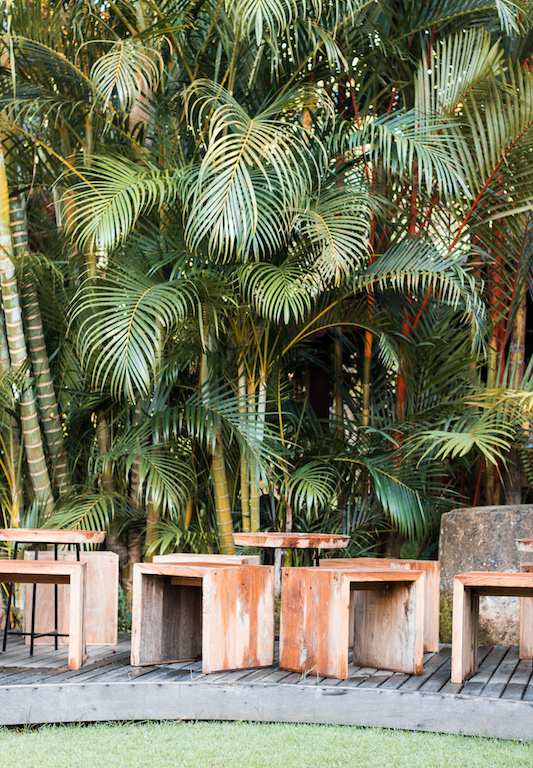 Tucked away amidst bamboo and leafy palms, each one is entirely unique. 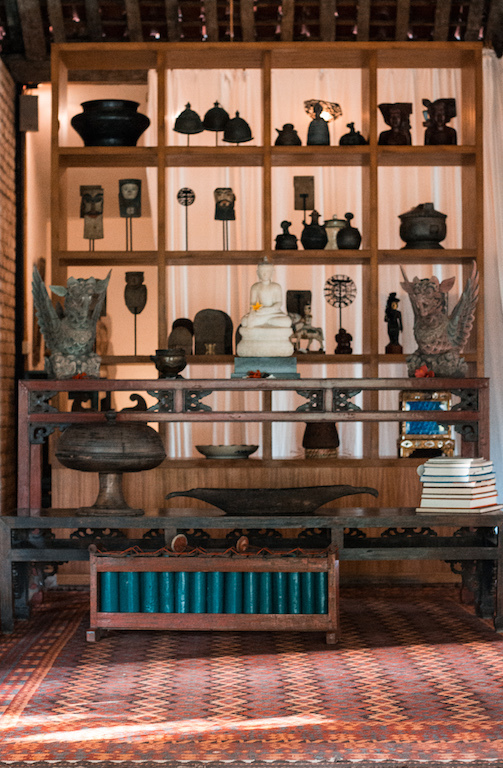 All are filled with antique pieces and teak furniture: former doorways become headboards, hand-painted cupboards hide televisions, and ageing floorboards creek underfoot. Capacious four-posters are covered in dreamy white bed curtains whilst outdoor rain showers complete the tropical aesthetic. This hotel truly practices what it preaches. An admirable 80% of the produce comes straight from their own organic vegetable garden, and what doesn't is all locally sourced, as in "literally picked that morning", emphasis Thomas. And you can taste the difference. It's that perfect marriage of flavour and nutrition. You feel like you're be utterly indulgent when ordering gluten free pancakes with mango and coconut cream (but don't regret it after), and totally full after courgetti spaghetti with smoked tomato puree. Coconuts the size of your head are the perfect post yoga drink. Which is what Desa Seni is all about... There is an impressive schedule, from Kundalini to Hatha, so no excuses for missing a class). All are welcome, but considering myself something on an intermediary yogi, I was a little disheartened to find myself very much at the bottom of the class. But happy to have my downwards dog detangled by one of the best Ashtanga instructors. Like ever. The spa is a must because, have you even been to Bali if you haven't had a Balinese massage? The answer, in my opinion, is a firm no, and having taken it upon myself to sample as many as possible (you're welcome) I can confirm that Desa Seni is one of the best. Chakra healing (the jury is out) and other Chinese inspired treatments are available. The perfect guest: Anyone interested in yoga, wellness, and eco-chic. Which is basically everyone these days, right? Best Room: Each one has its own charm, but the Suite Houses are the most spacious. Wi-Fi: Yes. Pet Friendly: Not Room Service: Yes. Rates: From £122 per room per night. Inc. Breakfast, Exc. Taxes. Words and photography by Megan Lambert.